The Virginia Historical Highway Markers Program was established in 1927. At 91 years, it is oldest state-sponsored marker program in the United States. Not surprisingly, the topics selected for the markers in the first decades of its existence were about the Colonial and Antebellum eras, and the Civil War. It was not a program that presented the diversity of the people in the Commonwealth – in fact, during its first 50 years, only five markers even made reference to African Americans. That situation began to change after WWII, but only picked up steam in 1990 under the leadership of Governor Douglas Wilder. To-date there are more than 250 markers that focus exclusively on African American citizens or events of statewide or national significance to them. An additional 50 or so markers make reference to the contributions African Americans made to Virginia as enslaved people. The achievements of women have also become more well-represented since the early days of the program, however, there is still much work to be done; ethnic groups other than African Americans are still poorly represented, and DHR has yet to erect a marker that acknowledges to Queer history. 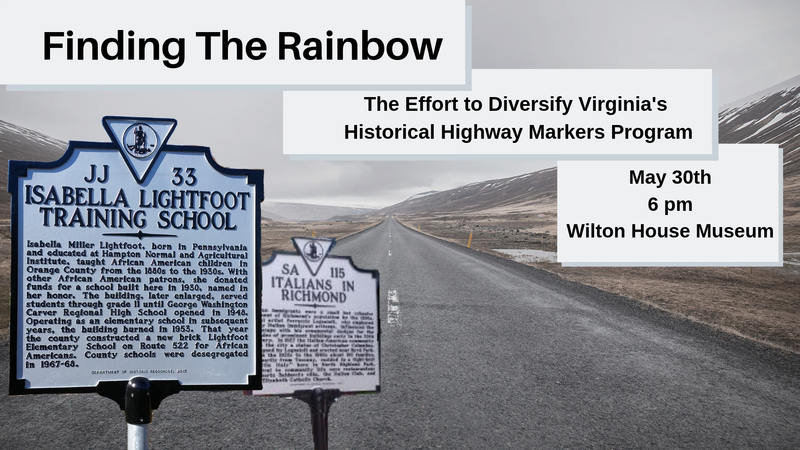 DHR is proud, however, to announce the publication of A Guidebook to Virginia’s African America Historical Markers and this talk by James Hare, DHR’s Director of the Division of Survey and Register, will focus on the challenges and achievements that have been made to place markers in the light at the end of the rainbow. This event is Free and open to public In Partnership with the Virginia Department of Historic Resources.